It's insane how much detail is in there, just waiting to be found. My favorite thing about emulating modern 3D games is the ability to run them at vastly higher resolutions—The Legend of Zelda: Breath of the Wild, for example, is stunning at 4K. Higher resolution rendering doesn't work so well for older pixel art games, or so I thought. A mod released today for Super Nintendo emulator bsnes, called HD Mode 7, shows how much detail you can get out of the faux 3D mode's graphics. You can see the difference above—the left half of the image is what Mode 7 normally looks like, and the right half is "HD". I spliced the two screenshots together. Here's a comparison you can play with yourself. The mod is brand new, and Redditor DerKoun offers a bit of detail: This mod lets bsnes "perform Mode 7 transformations (incl. HDMA) at up to 4 times the horizontal and vertical resolution." If you're unfamiliar with Mode 7, it's a graphical technique used in many SNES games to create the illusion of 3D by rotating background layers. It's used in Mario Kart's course map, the overworld you fly your airship around in in Final Fantasy 6, A Link to the Past's map, and so on. Mode 7 can also be used to create some other visual effects, but that's the most famous and familiar one. It's common enough in SNES games that this mod is a big deal. Because wow, does it look good. 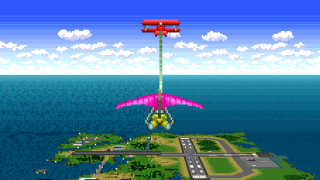 The Pilotwings and and F-Zero comparisons are the most striking to me. In F-Zero, the background outside the track is a complete mess of pixels. I can discern patterns, but that's about it. In "HD" it's so crisp, I can actually tell what I'm looking at. And that's actually worthwhile in Pilotwings, where the blobby island suddenly becomes crisp. There's actually a ton of detail on the runway, for example, that's completely lost at the standard resolution. bsnes emulator author byuu has already said he plans to include the feature in a future build of the emulator "if at all possible" and seems pretty psyched about the whole thing. Modder DerKoun has indicated there's more work to be done on the mod, particularly checking to see how it works in other Mode 7 games and tweaking its implementation. I can't wait to see how it looks in Super Castlevania 4 and Final Fantasy 6. Update: More examples are rolling in from emulator author byuu and others, so I'm rounding them up below.